The imminence of another landslide victory in Anambra state by the All Progressives Grand Alliance, APGA, in the forthcoming general elections has been predicted. 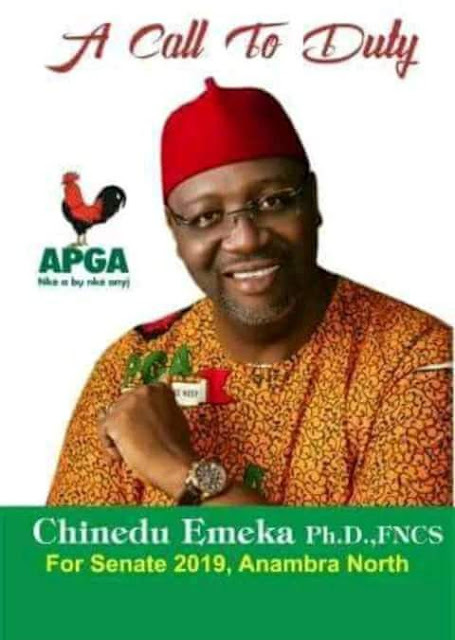 The Senatorial candidate of the party for Anambra North District, Dr. Chinedu Emeka stated this in a political gathering at Atani, in Ogbaru local government area. Dr. Emeka explained that apart from the massive and verifiable achievements of APGA led governments in the state in the past twelve years and ten months, the party is sincerely regarded by Ndi Anambra and the people of the Southeast geopolitical zone as their own property which must be preserved and protected in Nigeria. He noted that due to the people oriented disposition and responsiveness of governments enthroned by the party in the state over the years, virtually all town unions, faith based organisations as well as workers and the masses are sentimentally and emotionally attached to the All Progressives Grand Alliance. Dr. Emeka, who was a former deputy governor of the state described Governor Willie Obiano as an effective mass mobiliser who deploys what he described as "digital methods to effectively deliver fundamental democracy dividends to the people.